The Songhua River (松花江 Songhuajiang) is located in northeast of China passing through key cities such as Harbin, Jiamusi, and Jilin. It is the largest tributary of the Heilong River (HeilongJiang), stretching for over 1,900 km from Changbai Mountains through the Heilongjiang. During winter, Songhua river freezes from November to March, and it has the highest flow when the mountain snow melts during the spring thaw. The Songhua River is probably more famous for its recent pollution disaster more than anything else. In late 2005, Songhuajiang was contaminated with benzene, caused by an explosion of a chemical factory in Jilin city, which led to the shutdown of Harbin city's water suppy for several days. The Chinese government continues to monitor the water quality of Songhuajiang and Heilongjiang - there are 16 monitoring stations along the river. The Songhua river flows through the northern region of Harbin city. 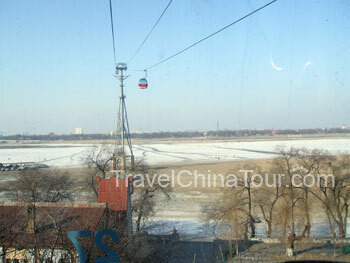 Just north of the river, is the Sun Island where the Harbin Snow and Ice Festival is held. Heading north from my hotel (Tianzi Hotel) located in the popular Zhongyang street, you'll reach the southern banks of the Songhua River, from where you can see the northern banks of the Sun Island. Following along the southern banks of the River is the Stalin Park, and along this stretch there is a Gondola service that takes you accross the SongHuaJiang river. A one way ticket accross the river costs $35 yuan (under $5USD), and if you purchase a two way ticket, it costs $50yuan ($7USD). Wanting to see how it looked up high in the gondola, I purchased a two way ticket. After you enter the building, you climb up to the 3rd level to get on the gondola. As the gondola cars pull in, it slows down, not making a complete stop, but it slows down to a crawl so that passengers can get on. 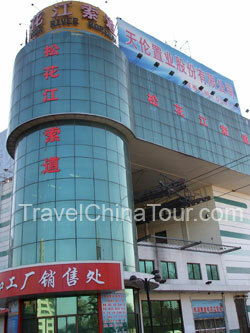 After you're seated, the doors shut by itself, and within a few mintues, you're on your way accross the Songhua River. View from south bank - heading accross to the north bank. View from the north bank, heading back to the south bank. The view up top is very nice. 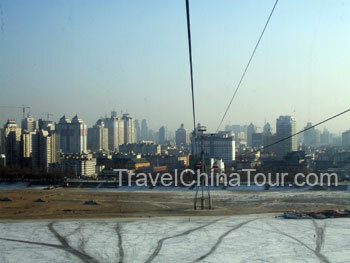 You get a nice view of the city, and can see the Songhua river down below. At this time of the year, the river is frozen over, so I saw quite a few people walking accross the river. I also saw several horse pulled sleds transporting people accross the Songhua River.